3M's E-A-R UltraFit earplugs feature a premolded triple-flange design that fits in a variety of ear canals. Push-to-fit plugs can be inserted even with contaminated fingers, and contain metal-detectable components in case they get lost. E-A-R UltraFit earplugs by 3M provide a convenient and clean work experience. The triple-flange design hugs the inside of the ear canal for a secure fit, and the soft polymer is washable and reusable. The stainless steel ball bearings embedded in the grips can be detected by metal-sensing systems if the plugs fall into a processing stream. 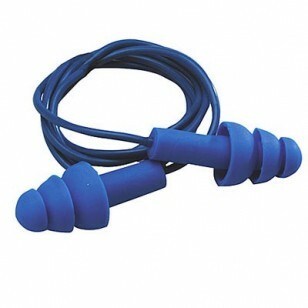 Provides a noise reduction rating of 25 dB.